Check-in and practice: 1:00 for each tournament. Play begins at 1:30. Teams will play in a 4 team round robin to begin the tournament. Seeding for the 16 team single elimination tournament will be decided upon the completion of the round robins. Every team is guaranteed to play a minimum of four games. Thirty minute time limit for each match. 16 team maximum with prizes for 1st, 2nd, & 3rd. Prizes include gift cards, dinners at area restaurants & more. Entry fee is $40.00 per team per tournament. All proceeds will support Habitat's affordable housing mission. Information and registration at www.habitatyorkcounty.org. 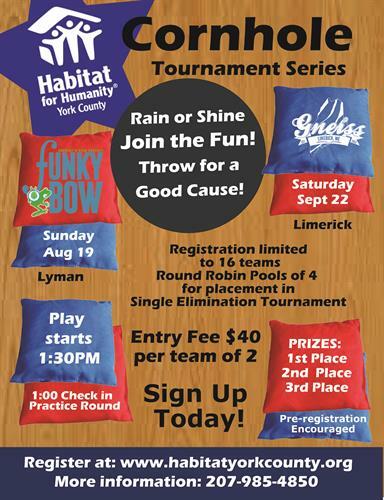 Call Amy or Sharon at 207-985-4850 or email: office@habitatyorkcounty.org for more information. Entry fee is $40.00 per team per tournament. All proceeds will support Habitat's affordable housing mission. No charge for spectators.